"To whom shall I pray, when death is the price for piety?" It's time to bust out the Aristotle you were supposed to have read in high school, for a consideration of Sophocles' Antigone, one of the essential texts of Greek tragedy and of Western theater; much as all comedies owe a sizable debt to Aristophanes, all drama can trace a direct lineage back to Sophocles. 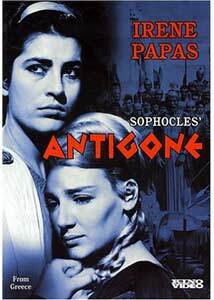 This 1961 Greek film of the ancient drama does a creditable job of bringing the tragedy to the screen, and of finding appropriate and more contemporary storytelling strategies for the source material; but Sophocles isn't radically reinvented here, because to try and do so would be a fool's errand. What you'll find is a respectful, moving incarnation of this titanic drama. If Sophocles came to Hollywood, development executives might give him a tough time for not providing enough backstory; also, this play is a sequel of sorts, to that runaway Sophoclean hit, Oedipus Rex, without which both Aristotle and Freud would probably have had to find other lines of work. Anyway, here's the Monarch Notes version of what you've missed: the title character here is the daughter of the disgraced King Oedipus; his two sons fought against one another in a brutal Theban civil war, and both were killed. The new king, Creon, agrees to a proper burial for Eteocles, the brother of Antigone who was loyal to him; the body of the other brother, Polyneices, is to be left to the vultures, a warning to other potential rebels. Antigone's loyalty is to family before polis, however, and she will not rest easy until both her brothers are paid the respect of proper burials; Creon will have none of it, and, in his wrath, decrees that Antigone herself must be buried alive. And this despite the fact that Antigone is to be the bride of Creon's own son, Haemon. So all the rich themes of classical tragedy are very much in play here: the hubris of Creon, whose overweening pride is the cause of his downfall; the sins of the fathers visited upon the children; the tension between public and private lives, between family and the state. Director George Tzavellas has assembled, literally, a cast of thousands, with columns of Greek soldiers marching in scenes of great pageantry; they emphasize Creon's political power while standing in stark contrast to their inability to save the king from the downfall catalyzed by his own tragic flaw. Irene Papas is moving and powerful in the title role; in repose especially, she radiates the sort of power and moral certitude of Renée Falconetti in The Passion of Joan of Arc. Equally good is Manos Katrakis as Creon, whose righteousness and certitude are upended; it's a solid and touching performance, at once omnipotent and fatally vulnerable. The acting style is especially interesting, as you can feel the slow rumble of the Method at work on this ancient text; the actors modulate well between filmic naturalism and externalized classicism. One of the challenges for a filmmaker with Sophocles is to make the movie more than just a filmed version of the play, and to respect the conventions of Sophoclean tragedy while also understanding that you're making a motion picture. On stage, almost all of the action is reported to the audience, not shown; Tzavellas uses a series of flashbacks and voice-overs, without too much fanfare, that convey the necessary information without rupturing the dramatic construction. There are no choruses here speaking directly to us, but rather an insinuating camera reinforced by the words on the soundtrack, communicating to the audience both aurally and visually. It is, overall, a handsome and moving piece of work, and is, as it should be, full of pity and terror. Image Transfer Review: It's too much, in this context especially, to call it a tragedy, but nearly every frame of the print used for this DVD transfer is full of awful scratching, discoloration, and bacterial decay; there even seem to be some missing frames, and black levels are uneven from scene to scene, and shot to shot. The transfer itself seems to be adequate, but the visual quality of this film is very, very poor. Audio Transfer Review: There are some dynamics problems with the musical scoring, which tends to be overpowering; then again, it's all Greek to me (yeah, like you could resist that one), and the film plays just as well with the sound turn way down low. Sophocles' play is one of the Rosetta stones of Western culture, and it's intelligently and movingly brought to cinematic life in this production. A sloppy, badly damaged print compromise the overall effect of this DVD, but that alone shouldn't dissuade you from considering the plight of the house of Atreus.